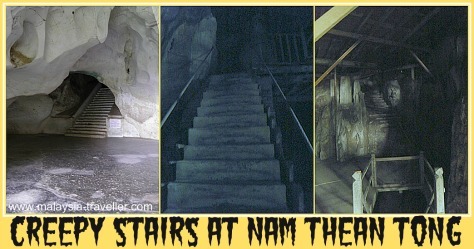 Nam Thean Tong Cave Temple - Could it be haunted? 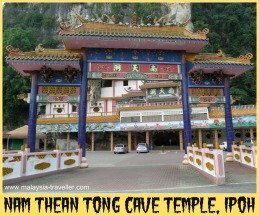 Let me tell you about my recent spooky experience at Nam Thean Tong, one of Ipoh's oldest cave temples having been established in 1867 by a Chinese priest called Kuong San Teik. 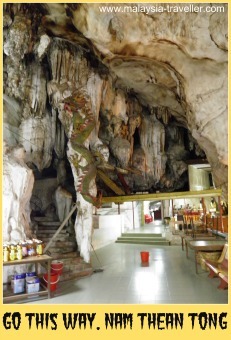 This cave temple, which is sometimes spelt as Nam Tian Tong among other variations and was formerly known as Lum Ting Toong, is located next door to another more famous cave temple, Sam Poh Tong. 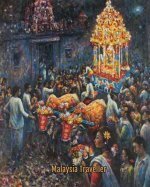 I had read that Nam Thean Tong is a Taoist temple and this was evidenced by the painting over the entrance of the Eight Immortals, characters from Chinese mythology who are revered by Taoists. Nam Thean Tong translates as Cave of the Southern Sky, 'southern sky' referring to heaven. Inside the entrance of the temple a few old caretakers were seated at a hotel-style reception counter, reading newspapers and eating noodles from polystyrene lunch-boxes. They did not pay me much attention so I approached the steps leading to the main altar where five statues of bearded deities looked sternly down at me. Seeing the donation box I thought I had better slip a banknote into the slit before taking a closer look. At this, one of the caretakers got up and rang a large bell. Was this to awaken the spirits I wondered, like the Eddie Murphy dragon character did in the film Mulan? The caretaker pointed me down a narrow passage off to the side and returned to his noodles. I wandered off along the passage and arrived at a white-washed cave decorated with colourful murals and a small altar. From here stone steps led up to a doorway where bright sunlight was streaming in from outdoors. On reaching the top of the stairs I could see that the steps continued up the side of this steep limestone hill in the direction of a wooden balcony which was visible behind some trees. These stairs brought me to another stark and empty cave with a concrete floor (think of this as the 2nd floor). At the back of this cave it was quite dark and another set of steps disappeared upwards into the pitch black. I should point out here that I was on my own and there was not a single person in the temple apart from those caretakers way back at the reception desk. It was a bit scary but I had a torch and since I had come this far I thought I would see what lies ahead. Pointing my torch into the gloom I climbed the stairs to a higher level (call it the 3rd floor). By the way I lightened the exposure of some of the photos appearing on this page to show some detail. In reality it was much darker. Some daylight was penetrating this level and I could make out that I was standing on timber floors laid on creaking trusses. I could hear bats screeching and plopping noises as their droppings splatted on the wooden floor. The whole place reeked of bats' urine. Sweating profusely from the humidity and exercise, I climbed another staircase, wooden this time, in the dark up to the '4th floor' where a refreshing breeze was blowing from an opening with a wooden balcony. From here there was a view of the surrounding area, obscured by chicken wire. The floorboards of the balcony shifted precariously when I tried to get a closer view. I guessed it was time to go back down. This is when I encountered the ghostly apparition. While descending one of the flights of steps I saw a figure moving down below. He (it?) appeared to be wearing some kind of white shirt but the face was shrouded in darkness. I peered at it for several seconds before it moved off to the right. Unfortunately my blurry photo here did not capture anything. Was it a person? My knees were more wobbly than usual as I descended the stairs but when I got to where the figure had been there was nobody to be seen. On that floor there was nowhere he could have been hiding. He could not have gone up without passing me and if he had gone down a level I surely would have heard the stairs creaking and anyway he was heading in the wrong direction for the stairs. What was it? Could it have been a ghost? Apparently there had been a disastrous mud slide here back in 1973. Could some restless spirits be present here? I do not really believe in ghosts. Was it one of the Eight Immortals - Iron Crutch Li perhaps who is usually described as hideous, hairy, deformed and scantily clad in rags? That's ridiculous! What would an Immortal be doing skulking in a dark cave? Maybe he was one of the caretakers checking up on me but, if so, where did he go? Most likely it was my imagination - tired and thirsty after my exertions (this was my third cave of the day!). Who knows? Maybe one of those ghost hunting teams that you see on TV should spend a night up there with their spirit-detecting instruments, motion detectors and night vision goggles. Rather them than me! After all this excitement I made my way back to the main cave temple. There was a notice saying that visitors are advised to leave the premises by 4:30pm as the temple is closed at 5pm sharp. I did not want to miss the deadline and get locked in the dark cave area. 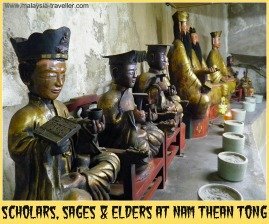 Why don't you visit Nam Thean Tong when you are next in Ipoh? Don't forget to take a torch and don't go alone like I did unless you like being scared! 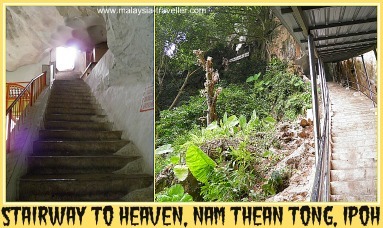 Directions to the Nam Thean Tong Cave Temple can be found on the Sam Poh Tong page. 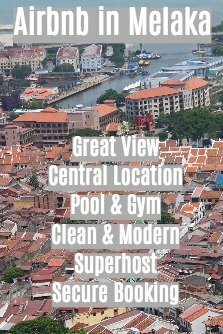 (Sam Poh Tong is right next door). If you are interested in the Eight Immortals (including Iron Crutch Li) and would like to find out more you could take a look at this article from the Journal of the Royal Asiatic Society. It was written in 1916 but it is still quite readable.